a 2.85% service charge will be added to AMEX, Visa Credit and Mastercard transactions. No charge is added for Switch, Maestro, Solo, Visa Delta, or Visa Electron debit card transactions. The OMNIA 700 is MBM's answer to the needs for flexibility, performance and quality of those catering professionals who wish to use 'great kitchens' also in 'small spaces'. In fact, OMNIA is fully modular - thanks to the variety of top and freestanding models, with a depth of 700mm and widths of 400, 700 and 1100mm, and offers a practically infinite possibility of combinations. The various modules forming the range - combine as one on top of the other, one beside the other, bridge-like, on feet or on wheels, allow one to identify for every functional necessity the best customised composed solution. 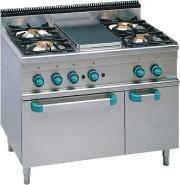 The full range of products from MBM OMNIA 700 is available from KCM at highly competitive prices. For further details please see our equipment pages under the headings of the specific equipment you require. To download literature on the MBM OMNIA 700 range of catering equipment right click below and select 'save as' (this is an Adobe acrobat file, additional individual equipment specification downloads are available with each item of equipment.